Gasoline is extremely flammable and highly explosive under certain conditions. You could be burned or seriously injured if it is misused or mishandled. Always stop the engine and do not smoke or allow open flames or sparks near the vehicle when refueling. Do not attempt to top off the fuel tank after the fuel pump nozzle shuts off automatically. Continued refueling may cause fuel overflow, resulting in fuel spray and possibly a fire. Indicator Light (MIL) to come on. Never pour fuel into the throttle body to attempt to start your vehicle. Always place the container on the ground when filling. Do not use electronic devices when filling. Use only approved portable fuel containers for flammable liquid. Do not use E-15 or E-85 fuel in your vehicle. For further information see the “Fuel Recommendation” in the “Technical and consumer information” section of this manual. Indicator Light (MIL) to illuminate. Malfunction Indicator Light (MIL) to illuminate. should turn off after a few driving trips. after a few driving trips, have the vehicle inspected by a NISSAN dealer. For additional information, see the “Malfunction Indicator Light (MIL)” in the “Instruments and Controls” section in this manual. If fuel is spilled on the vehicle body, flush it away with water to avoid paint damage. Turn the fuel-filler cap counterclockwise to remove. Put the fuel-filler cap on the cap holder 1 while refueling. Insert the fuel-filler cap straight into the fuelfiller tube. Turn the fuel-filler cap clockwise until a single click is heard. 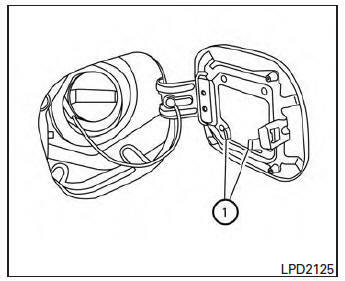 Remove and install the fuel-filler cap as previously described as soon as possible. Tighten the fuel-filler cap until it clicks. 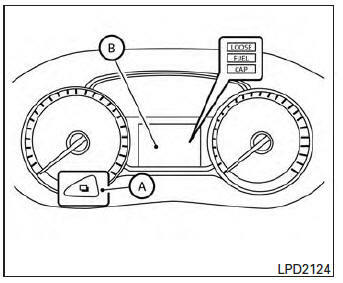 Press the loose fuel cap warning reset button A in the meter for about 1 second to turn off the LOOSE FUEL CAP warning message B after tightening the fuel-filler cap.